Gem: Daddy, do you want a surprise? Such is my life. For the record, we ended up making the pie I planned on, and she got away with being cute. It’s a kind of win-win. 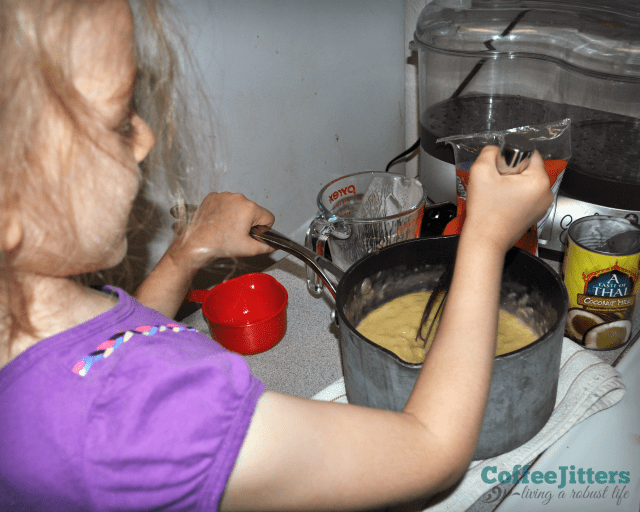 And, she was a great help in the kitchen. The Dahlia Lounge has the best coconut cream pie in Seattle. Maybe anywhere. Aaron and I are big fans. 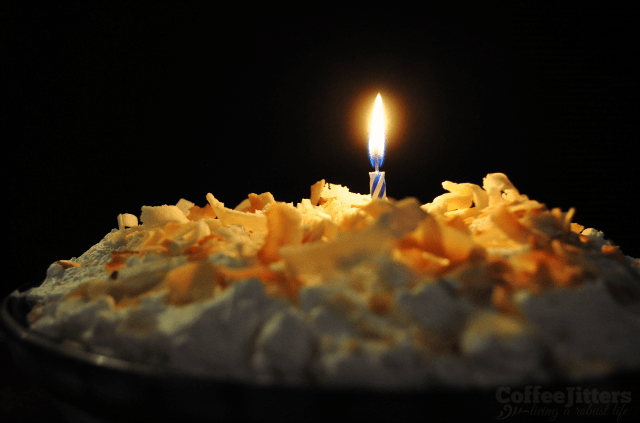 I was so thrilled to find that Tom Douglas and his team published the recipe for their Dahlia Triple Coconut Cream Pie in the Dahlia Bakery Cookbook: Sweetness in Seattle. This cookbook is a great teaching cookbook. It’s more than just recipes, and it covers the how and why of techniques, so you really learn how to cook rather than just how to follow directions. That was the pie I made for Aaron’s birthday. And it was amazing. Make sure the butter is very cold. Combine all ingredients except the water, and pulse in a food processor until it forms coarse crumbs. Intermittently pulse and add a tablespoon of the cold water until a pinch of the dough holds together when pressed between your finger and thumb. Turn the dough out onto plastic wrap on the counter. Use the wrap to pull the dough into a disc. Chill for an hour before proceeding. Unwrap and turn the dough out onto a lightly floured board. Roll the dough to a 1/8″ thick circle, checking underneath occasionally to make sure it does not stick to the board. Place dough in a 9-inch pie pan, and trim, allowing about an inch to hang over the edge of the pan. Turn the edge under, and pinch edge all the way around with fingers to finish. Chill the pastry for an hour before baking. Place some parchment paper in the pie shell and fill with dried beans to prevent the shell from puffing up during baking. 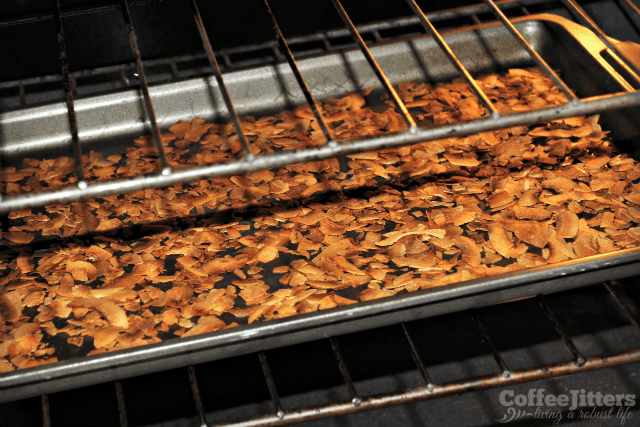 Bake for 20 – 25 minutes, then remove the pan from the oven and use the paper to lift out the beans. Return the shell to the oven to bake another 10 minutes. Cool the shell completely before filling with the coconut custard cream. Combine the milk, coconut milk, and shredded coconut in a medium sauce pan. Scrape the seeds from the vanilla bean and add the bean and scrapings to the pan. Stir occasionally over medium-high heat, until the mixture gets ready to boil. Put the eggs, sugar, and flour in a blow and mix them together well. To keep the egg mixture from curdling in the hot milk, temper them by adding a third cup of the hot milk mixture to the egg mixture. Blend well. Then add the eggs to the hot milk mixture. Keep the heat medium-high, and continue whisking the mixture for several minutes until it becomes very thick. The mixture should be bubbling a bit through this process. Stir in the butter until it is melted and well combined. Remove the vanilla bean. Fill a large bowl half way with ice and water. Pour the custard into another bowl, and place that bowl in the bowl with ice water. Keep stirring the custard until it cools. Cover the custard with plastic wrap. Place the wrap directly on the custard to keep a skin from developing. Whip the heavy cream, sugar, and vanilla together until peaks hold their shape. 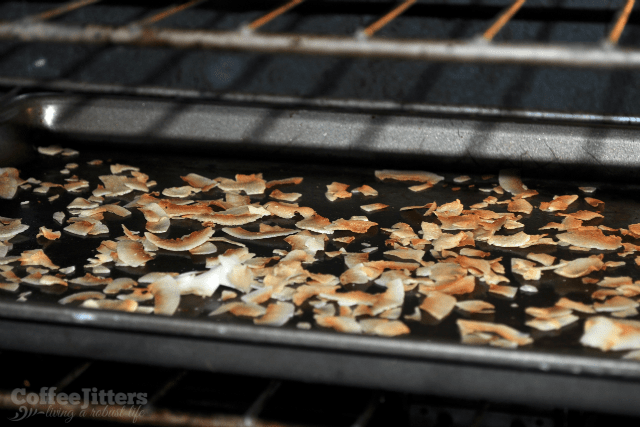 Spread the coconut chips on a baking sheet and lightly toast them at 350°F for 5 to 7 minutes. Not that I would ever burn coconut. Nope. Not me. Make sure the pie crust is completely cool. Make sure the custard is completely cool. Pour the custard into the pie crust, and even out the top. Cover the custard with the whipped cream. This can be spread on, or for a prettier finish, piped on with a pastry bag and a star tip. 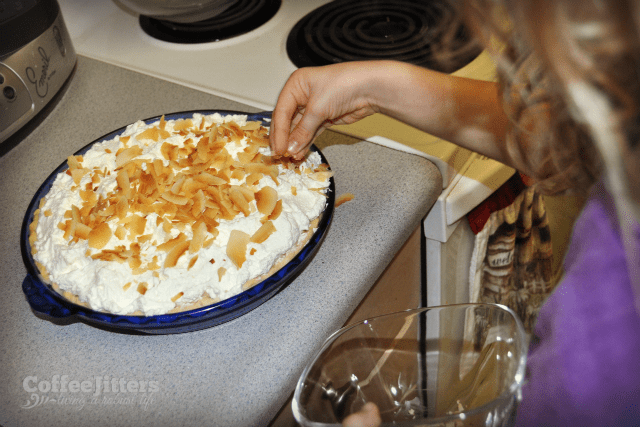 Garnish with the toasted coconut chips and then use a vegetable peeler to top off the pie with curls of white chocolate. recipe is from the Dahlia Bakery Cookbook: Sweetness in Seattle by Tom Douglas. Happy birthday, my love. You are a wonderful husband and father, and we love you. I hope 39 is an awesome year for you. FTC Disclosure: of course, I use affiliate links wherever possible, including this post.